Trying to answer this Q, I just re-watched the HD version of ROTJ and noticed that Jabba the Hutt had an injury on his tail. Originally, I thought it was from a blaster bolt shot by Luke as he was dropped into the rancor pit, but then I saw that it was there even before, when Luke just walked in (also, Hutts' skin is supposed to be proof against blasters). Is there any information in Legends or DVD extras that explains how Jabba got his tail injured? 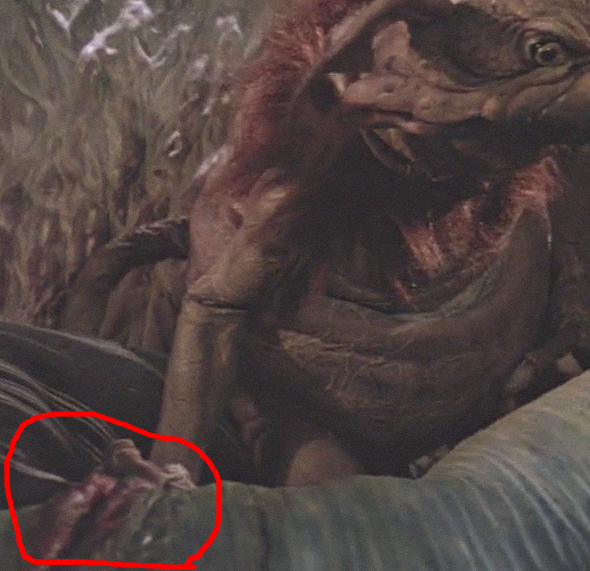 (Note: I considered that what I think is an injury could be some part of Jabba's Kowakian monkey-lizard body wrapped around Jabba's tail. 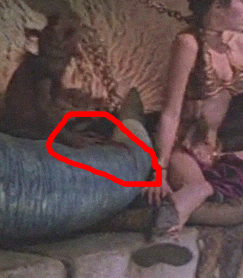 But judging by Jabba's skin movement; as well as changing position of monkey's hand, it's a tail injury). ~24:15 minutes into the movie, when Luke tells Jabba that "you will bring Captain Solo and the Wookiee to me". After having reviewed countless books, comics and interviews about Jabba's fictional life between 'A New Hope' and 'Return of the Jedi', the sole reference to Jabba suffering any sort of tail injury seems to be in the revised 1997 "special" edition of Star Wars IV where Han steps on Jabba's tail in one of the scenes that Lucas added in order to upset fans enhance the story. There appears to be two conflicting stories regarding the split in Jabba's tail. Whilst clambering over Jabba the Hutt, one of the high heels that Carrie Fisher was wearing accidentally punctured the latex casing and pierced Mike Edmonds who was operating the tail inside. Although sounds like an interesting anecdote, the filming sequence is wrong (Jabba's death scene was filmed last due to the danger of damaging his latex outer casing). On top of that, there's no attribution for the quote, the injured section would be far higher and most tellingly this factoid isn't mentioned in any of the countless interviews given by the other Jabba operators. The second (and more plausible and mundane) explanation is that the scar makeup simply covers a join line. 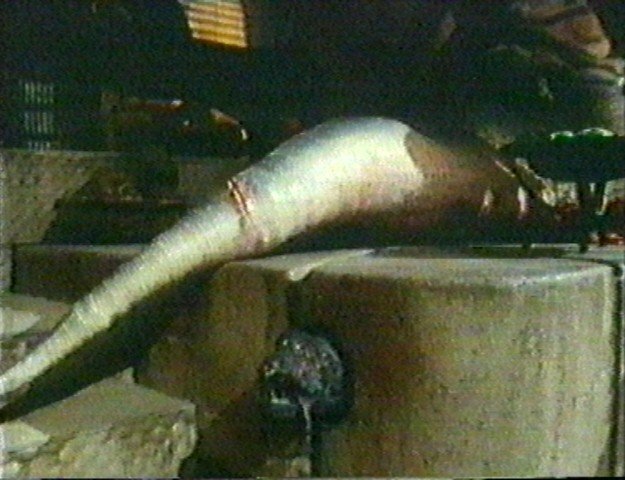 As you can see from this video, Jabba had two different tails, one which was mechanically articulated and one which was operated using a simple string pulley. The split occurs precisely where you see the scar. Once Jabba was finished and tested in the workshop we had to plan how to move and install him onto the moving throne base on set. This was quite high up on a rostrum. He also had to be dismantled and moved to the bedchamber set and later to the sail barge set. For both of those we fitted a simpler internal tail volume, made of segments of foam polystyrene that could curl up tighter than the cable version. This simpler tail was flickered and thrashed (when he died) with fishing line strung from poles (i.e. a giant string puppet). 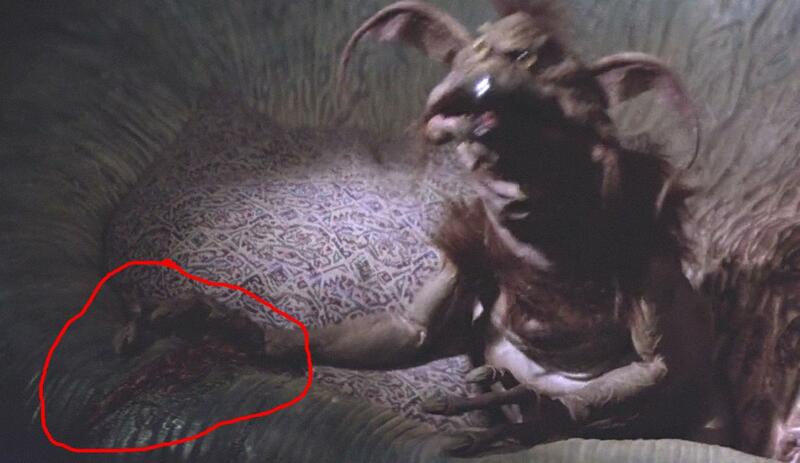 I have an old memory of a memory of being really little and seeing a scene where salacious crumb bites jabbas tail, because nobody else could wake him up. Maybe it was on a TV broadcast, or on the laserdisc version, or on a library copy… I was born in 84 so never saw it in the theater. I am certain that this was a deleted scene. I watched the deleted scenes though, and the Monkey bitting Jabba's tail is not in there. Han Solo walked around Jabba's head, not near the end of his tail. The first time you see the cut is actually right after the green dancer falls through the trap door. Jabba's full body is in the scene and near the right of the screen you can see the cut. You tuber Viral Killer uses the Carrie fisher story too, but they say it is fact. In Star Wars the only person I can accurately blame is Darth Vader's lighsaber, but the comic only mentions a force choke used on Jabba, so I'm not sure. Not the answer you're looking for? Browse other questions tagged star-wars star-wars-legends return-of-the-jedi or ask your own question. What was the character that cried “jabba jabba” in Star Wars? Why did Darth Vader die in Return of the Jedi? How did Leia arrive on Tatooine in Return of The Jedi? Did Luke use precognition to prepare for the Skirmish at the Great Pit of Carkoon? How did Jabba kill Jedi “Back in the old days”?